I am a big fan of the 10m band. An extra receiver would be nice to listen on 10m, so I can use the TS-480HX to listen across the HF bands. But with a second receiver, you probably need an extra power supply and extra space in your shack. A second hand receiver will likely cost you $300 or more. Then there is a solution, if you have a PC, laptop, tablet or smartphone. There is a receiver that costs you only $14. 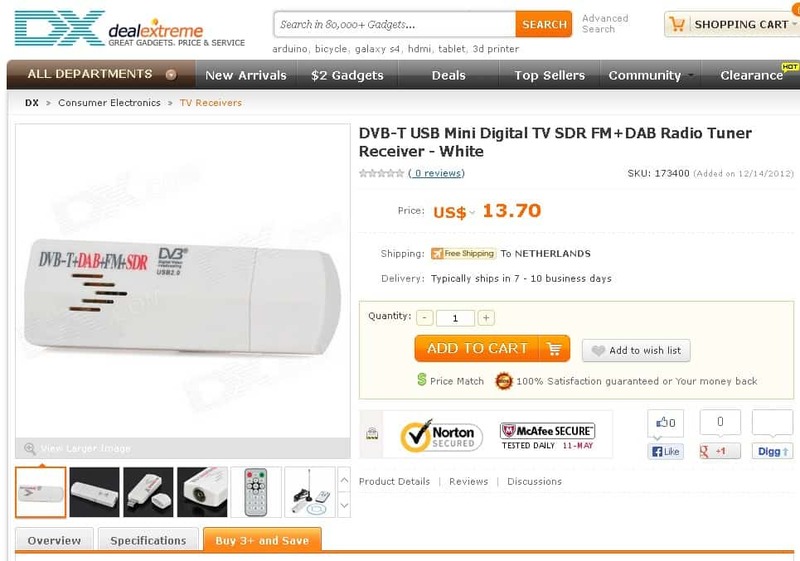 It is called SDR on a DVB-T stick and is as large as your average USB memory stick. SDR stands for Software Defined Radio, where a computer replaces a big part of all the electronics in your communications receiver, like mixers, filters and demodulators. All you need is a computer, an antenna and a device with tuner that digitizes the received signals into 0’s and 1’s (bits). Until some time ago SDR’s were quite expensive, like Flex-radio, WinRadio and Perseus models. But users report awesome performance. Since a few years cheaper more simple models enter the market, some ready built, others in a kit, like the popular FiFi-SDR kit, Funcube Dongle Pro and SoftRock kit. All very compact as a dongle with USB connector, ranging between $70 and $160. Late 2011 I decided that such an SDR would be a great and not too expensive addition to my shack. It will act as second receiver and a wide band scope (like modern expensive radios have) to scan the band visually. Because my TS-480HX only covers HF and 6m, I wanted a model which could also tune to VHF and UHF besides HF. That allowed me to listen the local amateurs on 2m and 70cm and activity on VHF and UHF in the Rotterdam port area, air traffic from the local airport and commercial traffic from the vast industrial area around town. But none of the available kits at that time covered HF, VHF and UHF. The only option would be two SDR’s, a FiFi SDR kit for HF and a Funcube Dongle Pro for VHF and UHF. That would cost me about $300, which was almost 100% above my budget, no option. But than I read a story about a USB stick for DVB-T (digital TV) reception that was suitable for SDR. This stick has the RTL2832U chipset from Realtek on board that dit the necessary sampling, together with the Elonics E4000 tuner chip. It could tune between 64MHz and 1700MHz. Popular SDR software like HDSDR and SDRSharp supported the so called RTL stick. However this stick was very simple, it incorporated all you need for a basic wide band receiver. The price was even more astonishing, roughly $20 to $30, and available from many online stores! I awaited the reviews of other amateurs before buying one, however I still did not have an SDR receiver that could do HF. Just when I decided to buy one, I read that the specific manufacturer changed model. Instead of the E4000 tuner, which had gone out of production, the new models had the Rafael R820T tuner on board. The R820T has substantial lower noise figures and better sensitivity. Best feature is that the R820T is able to tune from 24MHz to 1766MHz, meaning it can also tune to my favourite part of HF, 24-30MHz. I went to search for the best price and landed on the DealExtreme webstore, from which I had bought other gadgets. For the astonishing price of $13.70 including free shipping from Hong Kong to The Netherlands, I ordered the stick. After two weeks I received my package and connected the DVB-T stick to a 4m piece of aluminum tube (which acted as an antenna) via a standard TV connector. I installed SDRSharp, which does not need very much CPU capacity, ran ZADIG to install the necessary drivers and the system was running. I had to do some calibration, as this RTL stick was about 1600kHz off frequency at 27.555MHz, but my extra receiver and band scope were up and running. Such a cheap device cannot be compared with a Kenwood, Yaesu, ICOM or Elecraft, but the results are more than surprising. 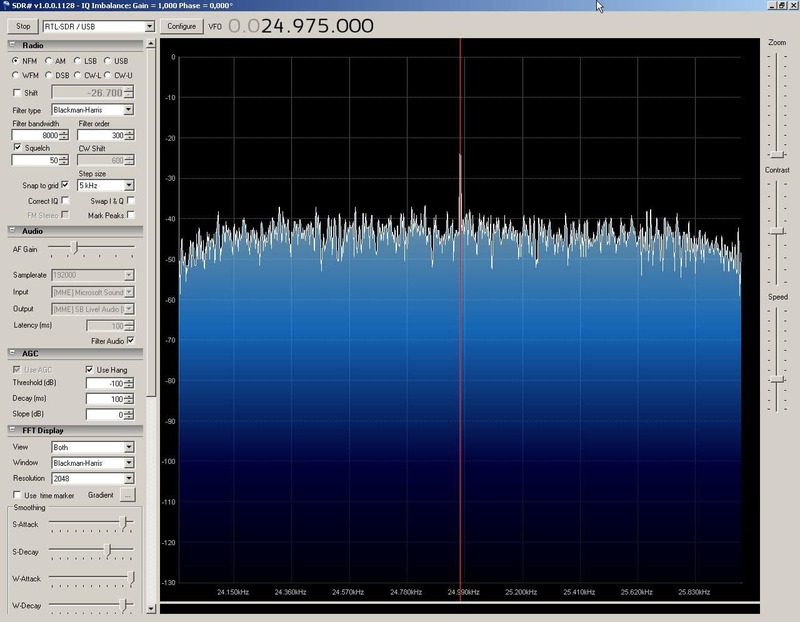 If you do not like the reception, you still have a very cheap band scope which you could also tune to the FM broadcast band for your favourite radio station. If you would like to experiment with this RTL DVB-T stick, keep in mind that are minimal system requirements or your desktop computer or laptop. 1GHz CPU or faster (preferable dual core). A free USB 2.0 port. SDRSharp (also know as SDR#) – run it from your hard drive or from a memory stick. Click to download SDRSharp+Zadig. HDSDR – demands a lot more CPU power and needs to be installed, no separate drivers needed. There are Android apps and an app for Apple iOS to run SDR on your mobile device. SDR on Linux systems, check out GNURadio. This entry was posted in Transceiver and tagged 10m, 12m, cheap, DX, HF, receiver, rtl, SDR, sdr sharp, Software Defined Radio, usb by Jean-Paul Suijs - PA9X. Bookmark the permalink. ← Previous Previous post: Long path propagation or short path propagation on HF?